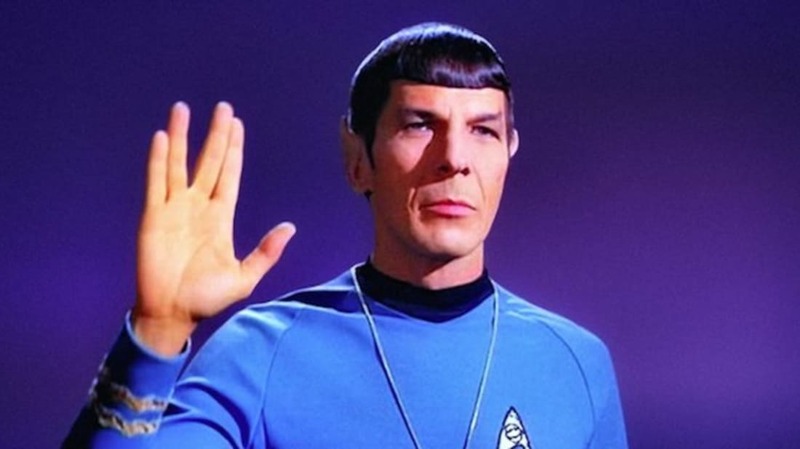 This morning, Leonard Nimoy passed away at the age of 83. Beloved for his portrayal of Mr. Spock on 'Star Trek,' Nimoy was also an accomplished director, stage actor, and writer. Few franchises have had the cultural impact of the various Star Trek television series and movies, and nowhere is that more evident than in the snippets of dialogue that have become a part of the American vernacular—and in some cases, found their way abroad, too. Here are 11 of the most notable Star Trek catchphrases, as well as a little more information about their origins. 1. "Live Long and Prosper"
The Vulcan greeting and the finger-separating hand gesture that accompanies it first appeared in the second season of Star Trek: The Original Series, during an episode titled “Amok Time.” Spock himself (actor Leonard Nimoy) has made no secret of the fact that the gesture and phrase were his idea, and that he based them on Orthodox Jewish blessings he remembered from his childhood. In the Jewish blessing, the position of the fingers forms the Hebrew letter “Shin,” which represents the name “Shaddai” (Almighty God). Nimoy put his own spin on the traditional gesture by holding up just one hand (instead of both) and changing up the verbal blessing slightly. While Spock never shied away from questioning the logic of those around him—usually Kirk—it wasn't until the second season that he took things up a notch and deemed the actions of the native inhabitants of planet Omega IV “highly illogical” in the episode titled “The Omega Glory.” Previously, it had always just been “illogical” or, in rare cases, “most illogical,” but it took a pair of natives attacking Kirk in a jail cell for Spock to pair his trademark raised-eyebrow reaction with the term “highly illogical.” The phrase would then be repeated in several more episodes, as well as the subsequent films and J.J. Abrams' reboot of the franchise. Bonus: “Highly Illogical” was also the name of Leonard Nimoy's 1993 music album featuring several songs he recorded in the 1960s (including “The Ballad of Bilbo Baggins”) as well as a few new tunes. 3. "Beam Me Up, Scotty"
One of the most interesting aspects of this phrase—a request directed at Chief Engineer Montgomery “Scotty” Scott for transport back to the USS Enterprise—is that it was never actually uttered in any of the Star Trek television series or movies. More often than not, the command was akin to “Three to beam up” or more directly, “Beam them up,” with the closest approximation being “Beam us up, Scotty” in a few episodes of the Star Trek animated series. However, William Shatner did say this line while reading the audio version of his novel Star Trek: The Ashes of Eden. 4. "I'm A Doctor, Not A..."
Captain Jean-Luc Picard's signature line was a part of Star Trek: The Next Generation from the very start, with actor Patrick Stewart uttering what would become his character's most memorable catchphrase in the pilot episode, “Encounter at Farpoint.” The episode was written by Gene Roddenberry himself, so it's likely that he wrote the line for Picard, though the phrase has been in use for quite a while in military circles as a way to tell someone to proceed with a command. 6. "To Boldly Go Where No Man Has Gone Before..."
The infinitive-splitting opening narration for each episode of Star Trek: The Original Series (with the exception of the pilot episodes) was famously recited by William Shatner, but the actual origins of the line are uncertain at best. Some reports suggest that it was inspired by a 1958 White House press booklet promoting the space program, though some have speculated that it came from a statement made by explorer James Cook following an expedition to Newfoundland. Writer Samuel Peeples, who authored the pilot episode “Where No Man Has Gone Before,” is often credited with the decision to make the phrase such a significant part of the series. The line was eventually repeated—with a few minor tweaks—in each iteration of the series and films. Possibly the most meme-friendly line of dialogue ever to come out of the Star Trek universe, this scream of rage originated in (no surprise here) Star Trek II: The Wrath of Khan. Left marooned on a dead planet by the evil villain Khan then taunted about his predicament, Kirk let loose with a primal roar—and the rest was viral-video history. 8. "I'm Givin' Her All She's Got, Captain!" Much like “Beam me up, Scotty,” this famous catchphrase often associated with USS Enterprise Chief Engineer Montgomery “Scotty” Scott in Star Trek: The Original Series was never said in this exact form by actor James Doohan in the series or subsequent films. The closest approximation is a line in the second-season episode “The Changeling,” when Kirk asks Scotty to divert more power to the ship's shields. Scotty responds with, “Giving them all we got.” However, Doohan did utter every word of the famous line as part of a cameo in 1993's Loaded Weapon, in which he turns up as a panicky police officer trying to fix a coffee machine. Similarly, Simon Pegg used the same line “I'm givin' her all she's got, Captain!” in 2009's Star Trek reboot, in which he plays a young Montgomery Scott. Russian crew member Pavel Andreievich Chekov's inability to pronounce the letter “V” became a recurring joke after the character was introduced in the second season of Star Trek: The Original Series as the ship's navigator. While it made for some funny moments throughout the series and subsequent movies, one of the most memorable pronunciation gaffes occurred during Star Trek IV: The Voyage Home, when Chekov begins asking passers-by in 1980s San Francisco where he can find “nuclear wessels.” Even though Walter Koenig had been playing the character for almost 20 years before The Voyage Home hit theaters, the two-word line soon became indelibly connected with his portrayal of the character. This famous line was first uttered by robotic aliens The Borg in the epic third-season finale of Star Trek: The Next Generation, titled “Best of Both Worlds, Part 1.” Not only did the 1990 episode offer up one of the greatest cliffhangers in television history, but it also coined a phrase that would live forever in the nightmares of fans—mainly because it was recycled for use in countless other series and films down the road. 11. "Set Phasers To Stun"
It was established early on in Star Trek: The Original Series that the phasers used by the crew of USS Enterprise had a “stun” setting (as mentioned in “The Man Trap” episode), and both Kirk and Spock often found themselves instructing their crewmates to use the non-lethal capabilities of their standard-issue weapons. However, it wasn't until the second season of Star Trek: The Animated Series that we first heard Kirk issue the command “Set phasers to stun.” The line eventually became an oft-repeated order in subsequent series, turning up in both Star Trek: Deep Space Nine and Star Trek: The Next Generation, as well as many of the movies (including 2009's reboot). This article originally appeared in 2013.